For the past year - ever since they were first launched here on Permanent Style - I have been wearing Sagans by Baudoin & Lange regularly and consistently. But it has only been in the past few weeks, as the temperature has soared and I've been travelling in Italy, that they have really come into their own. In hot weather, with a small invisible sock, I can wear Sagans all day long and remain cool and comfortable. No blisters, no sweaty feet. If I walk for hour after hour, my feet will get tired without the normal structure and sole of a proper shoe. But even this Allan (Baudoin) has mitigated with a particular insert under the ball and heel of the foot. I'll go into this in more detail in a fuller piece on dressing for very hot weather, in a couple of weeks. Right now, I am proud to say that Allan and Bo are offering a new colour of Sagan that I have designed myself - the lovely grey/brown you can see pictured here. I've worn both brown shades, and black, in the Sagans but I always felt there was a gap for a versatile suede that bridged slightly smarter and more casual clothing. This is the result. A brown whose earthiness will make it perfect for warm colours such as brown, tan and green, but whose grey cast also makes it suitable for cooler colours - greys and navy. In the pictures here I'm wearing them with off-white linen, but they have also gone well with a navy cotton suit, green linen trousers, and grey Crispaire. The versatility also has the advantage - of course - of making them even more useful for travelling. There is also - though it is very slight - a subtle purple cast to the colour. You can see this particularly when you look at the reverse, inside the shoe. As they are unlined, you can see the topside of the leather there, and it has a grey/purple tinge. I was honoured to be asked by Allan and Bo to help come up with a new colour for the range, and even more pleased now to see the results. The new 'Bark Grey' colour is available on their site as of this morning, in a limited run of 50 numbered pairs. There are three styles, as shown above. You can see and buy the pair here. You can follow the discussion on Baudoin & Lange sagans – my colour by entering your email address in the box below. You will then receive an email every time a new comment is added. These will also contain a link to a page where you can stop the alerts, and remove all of your related data from the site. Hey Simon, seems like the link is not working? The link is up and running. But please let us know in case you are still having trouble accessing it! We can always send you a custom link in case you remain having troubles. I love the shirt jacket. Please could you detail the outfit? Simon, you mention a limited run – is that ready to be shipped now or will it take 3-4 weeks for them to be produced first? Hi Simon, it seems like a heel is slightly different from other colours. It looks more dressy, more in “bespoke” style. The colour sounds brilliant. I’ve recently been falling in love with brown suedes with a bit of an urban (grey-purple) cast to them – finding them all wonderfully versatile. Just ordered a pair of these – my first B&L. I’ve gotten my B&L a few weeks ago, and wore them to the office, getting bread, travelling, strolling arround in the city, etc. These are easily the most comfortable shoes I own. They go so well with a casual suit, chinos, denim and even shorts. When it comes to comfort, I’d choose them any day over my EG Tassels, JL Lopez’s or SC Penny’s or even CP trainers for that matter. I orderd a few more and will probably replace my Gommion’s over time with them. Simon, I’ve been looking for some suede loafers for general wear recently. In previous posts you have said that these are only really suitable for indoors, or brief/limited (low wear) trips out. Is the same true if you add the optional “interchangeable rubber grips” (which B&L say give an indefinite – which I presume simply means longer – lifespan)? With the rubber, could they be a good replacement for welted suede loafers? Thanks! I would update that advice a little and say they can definitely be worn outdoors, though perhaps not still in a whole day of walking. Baudoin & Lange Sagans – we guarantee you’ll feet will stay dry and you won’t be kicked out of any race! Brilliant – I wondered if anyone else would pick up on this! Been trying to purchase a pair for the last hour, the checkout system doesn’t appear to be working. The link takes me to the proper site, however it does not allow me to add them to my cart. The webshop platform we are running on had a checkout error lasting for about an hour, but they seem to have fully resolved the issue as of now. Where are your small invisible socks from? Why not the H&M version? Why pay more for items where “craft” is irrelevant? I was talking about the “invisible socks” not the shoes. Just curious why one should go for Trunk’s significantly higher priced socks over H&M’s more than satisfactory and much cheaper version? Oh I see, my apologies. There isn’t much of a difference, to be honest. I also have some from Uniqlo that are good. Been wearing my B&L for a year now. Still love them! How is the sizing? I wear crockett and jones on the 348 last in 9 (uk). Do you think size 9 will work for me in these? Our sizing runs true to size. In your case, I would certainly recommend a size 9 (43) in our shoes. Thanks. Even though I am a 9 in Crockett and Jones I am often a 44 in other shoes, for example espadrilles. Is there much space in the toe box? How is the sizing. I am usually a large 9.5 with a wide foot. I am a 44 in the continental system? Our shoes are true to size, with added flexibility in fit due to the unlined structure and the soft suede leather we use. I would certainly recommend going for a size 44 in your case. Any chance of a Naples city guide? I enjoy those posts most of all, and am considering a trip in a month or two. I’m tempted, but I’ve never ordered shoes via the Net. What’s the sizing like? Fit is critical with loafers. In U.K. sizes I’m 8.5. 42 can be on the tight side, and 43 too large. There is always a first! Our loafers are inherently designed with the main objective of comfort and fit. Due to the unlined structure of the shoe, the fit molds a lot more than you might experience with typically lined shoes. This has the great advantage of our loafers being an ‘easy’ fit and thus easier to order remotely while getting the sizing right in one go. In your particular case, I would recommend opting in for a size 42. We always recommend a snug fit at the start as the soft leather will start forming towards your feet. If you have any trouble ordering online, don’t hesitate to send us an email! I’m sorry to ask what might be a stupid question, but are the pictures of you above definitely in the bark grey?! The look different to those on the B&L website, which seem to really show the grey tones and almost suggest a slight difference in colour tone between the vamp and the main shoe. I’m tempted as my 2nd pair but the real life pics look very similar to the dark brown. Might just be my poor colour perception! Yes, the colors on our website are a better indication of the color tone. But as Simon indicated, there are some shades of brown in the color mix so it has some slight similarities naturally. Thanks also, Simon – although damn you it means the Friday Polo’s have been bumped down one on the list! Fingers-crossed you’ll still have smalls available in a couple of months. We won’t have them in this style for a while Ant, new styles coming… Sorry! Would you recommend this for someone who is flat footed? We currently have multiple clients who would diagnose themselves as flat footed and wear them with great comfort. But there might be someone here who can speak from his own experience. I like the linen pants you are wearing, may i know the swatch number, the bunch and the manufacturer. Hi Simon, would you ever wear Belgians with tailored shorts? 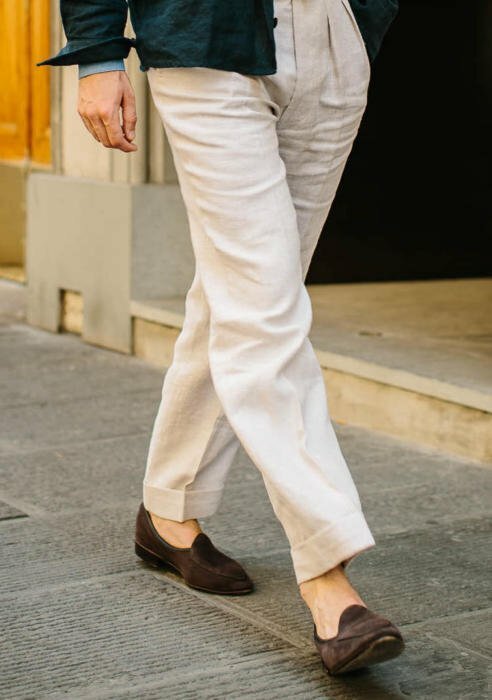 I see a lot of people wearing Goodyear welter loafers with shorts recently but the gap in formality always looks a bit jarring to me. Does the unstructured nature of Belgians make them casual enough in your view ? If not any recommendations (other than boat shoes) for when espedrilles are too casual? Really nice trousers, may I ask where you got them made? Will vat be deducted from the price when shipping outside of the EU (to Norway)? Would you recommend going for the rubber grip? Will you then wear it on wet pavement (after a summer shower for example) or would that kill the leather? Thanks. In that case it sounds like the rubber grip adds no real advantage? It adds grip and longevity, but it’s a question of whether you need either. Looking forward to the dressing for very hot weather post. I just returned from a camping vacation in the badlands of Alberta, Canada. It was extremely hot (34 degrees centigrade). I was sweaty, happy and very un-stylish in shorts, tank top and wide brimmed hat. 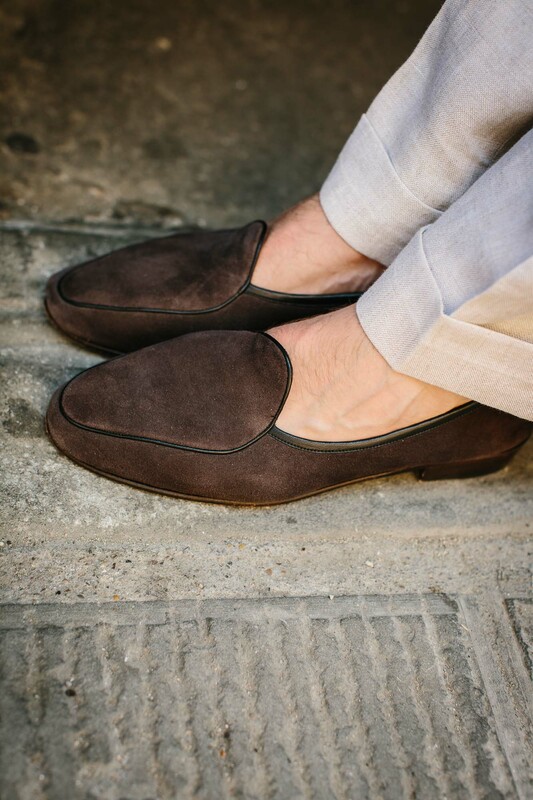 I have a pair of suede loafers in a grey-brown (a little lighter brown than yours) that I also find surprisingly versatile. They were found by luck on deep discount at a menswear store in a city I traveled to for business. Always satisfying to find a bargain that works so well. Can I ask, what size is your shirt jacket from Drakes? I’m having trouble placing my order through the Baudoin and Lange website, and have reached out to them via email with no reply. Is there an alternative way for me to place an order for the Sagans in your color? I’m afraid we didn’t get any email from you, but please do send again and I will get to it right away! Great, could you please confirm the appropriate email address? I’ve sent multiple messages to contact@baudoinandlange.com and have also filled out the online form. I’m wondering about the relative formality of the classic v. string versions of the loafers. I assume the classic is the most formal by virtue of its simplicity. However, since the string references lace-up shoes, I’m wondering if it only slightly less formal (noting, of course, that since these are suede and loafers, as well as a lighter brown, they are aren’t particularly formal). Yes, I wouldn’t concentrate too much on the formality, but the strings will be less so. Are they making the shoes for Rubinacci? who do you recommend for invisible/no-show socks? Trunk has a decent range, largely Tabio ones, and Falke are also good. But I also have Uniqlo ones that are just as good. what happens after the limited run of 50? Will you be making the colour available again or stopped? Hi Simon, what size did you take in these?? Normal size? Nice article, that made me purchase my first pair of B&L loafers. Unfortunately the company has yet to send me an order confirmation and does not respond to any of my emails (I wrote the to ask for an OC and I wanted to modify the size as well). The purchase should have gone through as this was clearly visible on their website. Lets see if they respond soon, it has been a week already. Where does the leather come from that you use? I’m probably misunderstanding, but on Facebook there is post about it coming from Hermes and in the latest edition of The Rake Magazine in says Cyprus…..which of course could still be Hermes. Placed my order when this article went live, and received an email stating that my order has shipped (I’m in the US). Looking forward to enjoying these shoes for the remainder of the summer. Has anyone heard of Buday shoes and if so does anyone have any thoughts on them. Someone on eBay wants to swap me a handmade pair of them for a suede C&J Hallam but haven’t heard of them previously? Hi Simon. This summer I have to go to 2 weddings (not required very formal attire) and I am really interested buying BL loafers (to use also outside these event). I have a DB (6to1) blue linen suit in W Bill 60266. Which color have I to pick? Dark brown – burgundy – navy/grey ? I recently placed an order with these guys and am finding them more difficult to contact than the Queen. Their site is also quite unstable. Is there a problem ? Can you ask them to respond to me ? Hi David. No problem that I know of. I can drop them a line, sure. Thanks Simon – they have been in touch and my loafers are on the way. I like the Sagan but think it may be to neat for me. Do you have any experience of the Loro Piana Summer Walk? I want something more sturdy than a slipper, lighter than a good-year welted loafer and more elegant than most boat shoes. I have also looked at Moreschi. No, but I don’t really like the style of the Walk much, not very elegant. 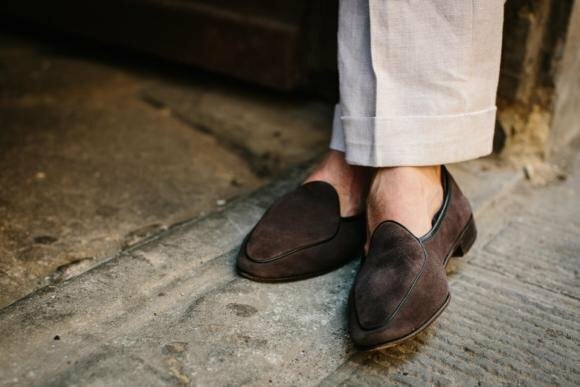 Try unlined summer loafers from the normal English makers? Is it me or have B&L significantly increased their prices? I was just about to order a pair for this summer since reading this post last year. I have a vague memory of a pair costing in the region of 200-300, not 300-400. At this price and not being able to replace the sole, do you Simon or any readers here, think this makes them bad value for money and we would be better off going for an unlined number from say C&J? They certainly have increased, yes. I’d say they’re still just about good value for money, given the quality of the materials and all being handmade in London. I guess not having the latter would make them cheaper. Unlined shoes from one of the Northampton makers would be a rather different shoe though – not really as light or as flexible, given this is a cemented sole. A better comparison is with other Belgian loafers probably. 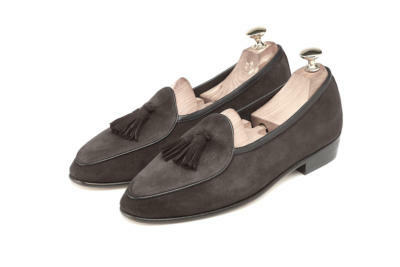 I am thinking about another pair of loafers, but struggled with the decision between the belgian loafer by Boudain&Lange and normal loafers in brown suede? Which would be more versatile? I like to combine with linen trousers but sometimes I prefer a more casual style with jeans, cause it is a bit more practicable to commute to work. I hope you see my point. I have decided to buy brown suede loafer from Meermin. They offer now an unlined version for the summer, which is very comfortable and soft. I guess, it is a very good value for the price. In terms of versatility, how do you compare your bark grey and oat brown? I presume you mean oak brown, though oat sounds cool! I think the grey is more versatile, though dark brown is probably the most versatile of the lot. Do you feel that the Nappa Deerskin Sagans could be worn throughout autumn (and perhaps, dare I say it, winter)? The images online seem to suggest an almost pebble-grain like texture. I understand that in terms of practicality, they wouldn’t be first choice for a blizzard, but providing it’s moderately dry would it be a terrible idea? Thanks Simon. I understand this is highly subjective, but would you say that in terms of style, opposed to function, a Belgian loafer would work for Autumn/Winter, if the loafer were a seasonal colour? Thanks Simon. Unfortunately I have very low volume feet and fallen arches which have never worked with a loafer (even with orthotics) before. I usually have the sides gaping open. I tried a Sagan at Selfridges and despite being tight across the toes (which I’ve been told should ease due to the soft construction), it turned out to be the only loafer I’ve ever tried that didn’t have this problem! Among the style of tassels, string and classic (that’s plain one), what’s your preference? As a follow up question, any reason why you prefer the plain one out of the 3 ? I find it the most versatile – between casual and formal. Good advice Simon! By the way, what do you think of Saddle Penny? Hi Simon, do you use shoe trees with your sagans? Thanks. Really like the color you created. Get a hard time to choose between the classical version and the tassle version. Can you sort of explain which type suite for what kinds of situation and fitting? Regarding the invisible socks, I try to look for a brand whose invisible socks do not show when wearing the B&L loafers. My pair of Pantherella invisible socks is still visible when I put on the B&L. Any suggestions? I really like this color but are thinking about buying something that can also function as a slipper in a more informal black-tie event. I am thinking about a sagan in midnight blue or something like that. An alternative can be the Albert in velvet from Crockett & Jones. I already have a lot of loafers in different shades of brown. Do you think the sagans work as indoor slippers and can they work with black tie. And in that case in which colors? (I really don´t want black because I would love to be able to wear them without black tie as well). They can just about work as slippers indoors, but they’re never going to be as soft as the slippers you’re used to, given the leather sole. Hi Simon I’d like to ask, besides comfort..my experience with unlined shoes from Italian shoe maker Manina Firenze are that overtime they become completely unwearable due to over stretching. Has this been the case with your experience with B&L Sagans? I would have thought a Mannina shoe would have a lot more structure than a Sagan though?